Let's call it like it is - Mark Gottfried was lousy in his last two seasons at N.C. State. The guy can coach, but he had lost his mojo and couldn't build any momentum. He had a ridiculous amount of talent - Dennis Smith Jr., who will run the point for the Mavericks for years to come, was there his last year; Caleb and Cody Martin, who are starring for an excellent Nevada team now, were there, and so on. But Gottfried just couldn't make things work and was below .500 in both of his last two seasons. He needed to go. Kevin Keatts took over last year, and despite not having Smith Jr. he went a solid 21-12 and went 11-7 in the ACC a year after Gottfried had gone 4-14. It was a heck of a job, and Keatts has been aggressive turning the roster into what he wants. Just two scholarship players who were here when he arrived are still here, so this is already his team. He did amazing work at UNC Wilmington, and I have faith in him here as well. This is a team that got only one vote in the preseason AP poll - compared to the 1581 Kansas got to top the poll. I look for them to get several more by season's end. A lot of guys are gone. A whole lot. Leading scorer Allerik Freeman graduated. Third-leading scorer Omer Yurtseven, a big young center, transferred to Georgetown. Three others graduated, and three others transferred. They probably needed name tags when practice started to keep track of all the different faces. The team has two transfers from last year who are eligible after sitting out last season. C.J. Bryce, a junior guard, followed Keatts from UNC Wilmington, and this is his first of two years of eligibility. He averaged better than 17 points a game as a sophomore and will likely start right away. Guard Devon Daniels has three years left after coming from Utah. He scored 9.9 points a game as a freshman, so there is upside here for him off the bench. Four more transfers will be able to play after joining this year. The most intriguing is D.J. Funderburk. He was a four-star recruit in the class of 2016 who signed with Ohio State, but things didn't work out there and he wound up at Juco. He was brilliant last year and was the top Juco recruit in the country this year. He will start at center here and will score plenty. Grad transfer guard Eric Lockett scored 14.3 a game at FIU last year and will be valuable off the bench. Samford grad transfer Wyatt Walker is a center with a decent scoring touch who will be a good backup for Funderburk. And then there is sophomore Blake Harris, a point guard from Missouri. He showed flashes in his one semester at Missouri and will be useful guard depth. The team added three recruits. Two four-star forwards came from the same school just 60 miles away in Fayetteville. Ian Steere will see time this year, while center Immanuel Bates will redshirt after shoulder surgery cost him much of his senior year in high school. The third player, four-star wing Jericole Hellems, has a nice scoring touch and will be a nice piece off the bench. The entire likely bench rotation - six players deep - are all new to the team. And so are two likely starters - Bryce and Funderburk. Bryce has plenty of experience with Keatts, though, so he has an edge. The three guys who are returning are all fairly useful. Markell Johnson is a fairly traditional point guard who led the ACC in assists last year as a sophomore. Braxton Beverly started beside him for much of the season as a freshman last year. And while he was effective enough with 9.5 points a game, he should be positioned for a nice sophomore leap. And guard Torin Dorn, a redshirt senior, was second on the team in both scoring and rebound last year. If you are counting along at home, there are four guards listed as starters - all but Funderburk. That is something Keatts likes to do, playing full court and staying aggressive. The nonconference schedule is pretty manageable. The first six games are soft, which will allow them to break in the new faces. UNC Asheville is the only mildly-interesting team in that stretch. They play at Wisconsin in the ACC-Big Ten Challenge, which isn't nearly as tough as it could be in some years because the Badgers are far from their best. They play major conference foes - but not dominant ones - in Penn State and Vanderbilt. And the biggest test they face - by a wide margin - is against a ranked Auburn squad. That one is at home, so an upset isn't entirely out of the question. 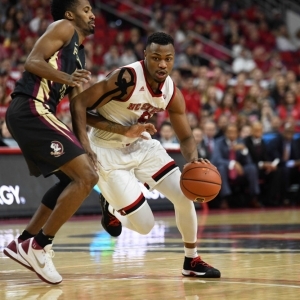 Conference play could be tough - the ACC always is. But they are lucky to play Duke and Virginia only once each, so it could be worse. The Wolfpack are at +10000 to win the national title at Bovada , which puts them in a huge group of 14 teams and behind 27 others. That's more or less where they should be. I respect that Keatts has aggressively built the team he wants. He has seven guards who will play and two more forwards who are standard wing types. This isn't a team that will be much of a presence around the rim, but they are going to be aggressive and tough to play against. The top three spots in the ACC seem locked up by Duke, Virginia and North Carolina. I'd love to see this team grab the fourth spot, and it feels like that is a reasonable target - a stretch but viable if this grand roster experiment comes together. In Keatts I trust. Doc's Sports college basketball handicapping team has set some lofty standards worldwide for college basketball handicapping. They normally do their best work at the beginning of the season. Get $60 worth of premium members' picks free . No credit card needed, and you will never deal with a salesman. Also, find out more about Doc's Sports expert handicappers college basketball results here . Get daily free college basketball picks on Doc's Sports NCAA hoops predictions page.